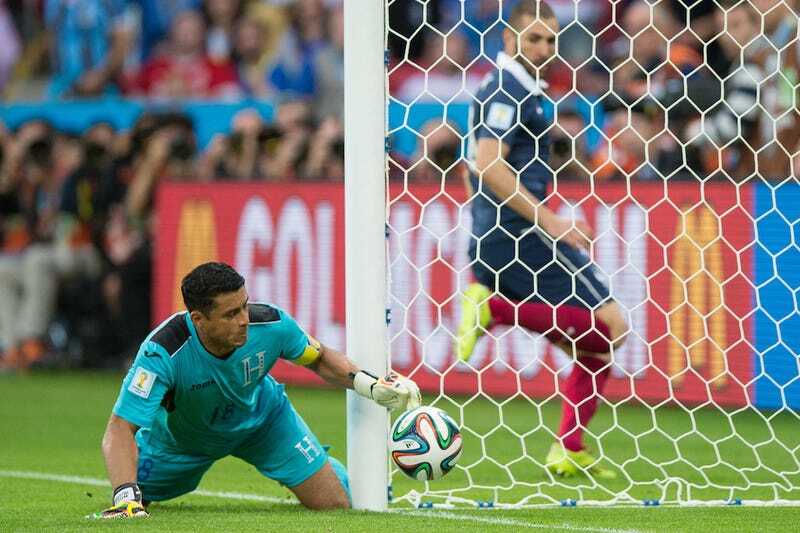 The call was an early success for goal-line technology, something FIFA has resisted for years. But in the space between soccer coming into the technical capacity to determine goal or no goal and FIFA dragging itself into the present, an array of options sprang up, some maybe even more technologically reliable than what we ended up with. So let's take a look at the tech we've got for the World Cup, and the broader goal-tracking landscape. The technology they're using right now in Brazil is made by a German company named GoalControl, and the concept should be familiar to tennis fans. At each stadium in Brazil there are 14 cameras strategically positioned around the stadium, seven fixed on each of the two goals. The cameras can record up to 500 frames per second, and spend the whole game tracking the movement of objects and people on the field, filtering them out to focus purely on the ball. When the cameras see that ball pass over the goal line, the system sends a little vibration to the referee's watch to let them know that a goal has been scored. GoalControl claims it can make that call with an accuracy down to 5 millimeters. So far, in the instances where the technology was actually necessary, it's worked well. (Costa Rica's goal today was another one that might've deceived the human eye alone.) But this isn't the only way to detect goals. There are three main types of ball-tracking technologies out there, says David Ricketts, a researcher at North Carolina State University who is developing ball-tracking technology for American football: wireless-radio-based technologies, camera-based technologies, and magnetic-field-based technologies. Starting in 2010, FIFA considered bids from companies using the second two of these. The longtime frontrunner in the race was a camera-based system made by Hawk-Eye, trailed by two different magnetic field based systems made by GoalRef and CAIROS respectively. You'll note that GoalControl, the company that won the bid and has its cameras trained on the World Cup right at this moment, isn't in that list. That's because GoalControl didn't even exist as a company when the bidding started. They weren't founded until 2012. For much of the process, everyone expected Hawk-Eye to win the contract. I asked GoalControl spokesperson Rolf Dittrich if he was surprised to have won the bid. "Absolutely," he said. Why did FIFA choose GoalControl? "You have to ask FIFA for the reasons," said René Dünkler from GoalRef. (GoalRef didn't totally lose out this World Cup. The company provides the wristwatches and handless wireless-communications devices that send the "goal" signal to the refs.) A representative from Hawk-Eye declined to comment for this story. While the camera system is familiar and intuitive, the magnetic-field system might not be. Here's how it works: Companies like GoalRef place wires in both the ball and the goal. The wires in the goal create a magnetic field that extends across the goal line. The wires in the ball disturb that magnetic field when they pass through it. No cameras, just fields. There are pros and cons, of course, to both these systems. Magnetic fields can see through people, weather, and whatever else might get in the way of the camera. Ricketts, who is working on a similar technology for American footballs, had an entire football team surround a ball and was still able to discern its position. Cameras, in theory, could be blocked by players in the box, snow, rain, or debris. "We think that we are a better system regarding conditions like a free kick or a corner ball," Dünkler said. Dittrich said that he is confident that nothing could get in the way of the cameras, though. "The development and mathematical calculations show that this is the best way to set up the cameras as they are arranged," he said, not totally addressing the premise. Before the World Cup, the system went through a lot of testing, including 2,400 different goal-line incidents, he said, and was accurate on all of them. Dittrich isn't worried about weather, either. "A football match also would not take place in extreme weather conditions," he said. Perhaps he missed the snowy game that the U.S. played against Costa Rica. Camera-based systems are also more expensive. The GoalControl cameras cost between $270,00 and $410,000 to install in a stadium and about $3,900 each match to operate. Dünkler wouldn't go on record with how much his system cost, but was confident that GoalRef's magnetic-field system "has a much better price" than GoalControl's camera system. Of course, magnetic fields aren't immune to variables either. If it's raining or snowing, the field is electrically different from when it's dry. Ricketts said that as long as GoalRef's technicians know what the weather is, they can take measurements and calibrate the system. But if the weather should change mid-match it could cause problems. But this is soccer, and emotions are often more important than facts. The idea of putting wires in the ball and goal posts was something many weren't very keen on. The wires make no difference to the weight or spin of the ball, nor do they impact the goal posts, but the camera system was touted for being passive, existing outside the field. Ricketts's guess is that FIFA went with a camera-based setup over a magnetic-field one because camera systems quickly and easily produce visualizations. "You'd have to do quite a bit of analysis and engineering to take the information from the GoalRef and make a picture," Ricketts said. GoalRef has worked on such a system, Dünkler said, but it can't produce animations as facilely as the optical system. Both GoalRef and Hawkeye will likely continue to chase after contracts with professional soccer leagues, and it's possible that FIFA could reconsider its options after this World Cup—especially if the camera system falters at all. But for now, you can probably count on at least a few more exciting goals determined by camera. Rose Eveleth is a writer, producer, and designer based in Brooklyn, New York. She's dabbled in everything from research on krill to animations about beer to podcasts about fake tumbleweed farms. In her spare time she makes weird paper automata and daydreams about hanging out with a pack of foxes.